smow Blog Design Calender: August 23rd 1915 – Happy Birthday Paul Schneider-Esleben! Multi-storey car parks are many things to many people. For skateboarders a playground, for love-torn teens a place of privacy, for authors and film-makers an all too easy metaphor, and for yet others ….. somewhere to park their car. For the German architect Paul Schneider-Esleben the multi-storey car park represents his career breakthrough. And one of his most defining projects. Born in Düsseldorf on August 23rd 1915 as the second of seven children to the architect Franz Schneider and his wife Elisabeth neé Esleben, Paul Maximilian Heinrich Schneider grew up in comfortable, conservative, catholic, surroundings, and for all in his father’s office where from an early aged he observed, assisted and learned the basics of architectural practice. Studying architecture was thus in many respects an inevitability, and in 1937 Paul Schneider enrolled at the TH Darmstadt; an education halted after just four semesters by the war and his conscription to the Luftwaffe in October 1939. In the autumn of 1942 Paul Schneider-Esleben* was stationed in occupied Lorraine where he made the fateful acquaintance of the German architect Rudolf Schwarz, who was leading local reconstruction work. According to Schneider-Esleben it was during conversations in Lorraine with Schwarz, and his colleagues Rudolf Steinbach and Emil Steffan, that he first heard of “Bauhaus”. Later, post-war, conversations with Schwarz introducing him to names such as Gropius, Le Corbusier, Aalto and Mies van der Rohe.1 Facts which should cause the more careful reader to question what the architecture education at Darmstadt was like if after 4 semesters in the late 1930s no one had spoken of Bauhaus, Le Corbusier or Mies van der Rohe? The answer is,very conservative, and a state of affairs which neatly underscores the hard ideological battles that were fought in architecture in the middle of the 20th century. Ideological battles which would accompany a large portion of Paul Schneider-Esleben’s career. Why he didn’t come across Bauhaus et al in his father’s architectural office in the late 1920s and early 1930s is another question. For another day. In spring 1946 Paul Schneider-Esleben restarted his education, albeit at the TH Stuttgart under Hugo Keuerleber and Richard Döcker, the latter having served in 1927 as construction manager for the Weissenhofsiedlung Stuttgart, and as such was very much aware of the international modernist movement. In October 1946 Paul Schneider-Esleben married Eva-Maria van Diemen-Meyerhof and following his father’s death in 1947 took over his practice before in 1950 he was awarded his first meaningful commission, a multi-storey car park on Düsseldorf’s Lichtplatz. As an architect Franz Schneider had concentrated on churches and renovations of historic buildings, according to Paul Schneider-Esleben2, upon taking over his fathers practice he at first continued this work, quickly however decided it wasn’t for him and moved the office from the rural idyll of Schloss Lembeck on the northern edge of the Ruhrgebiet, to cosmopolitan Düsseldorf in search of more contemporary projects. After realising various small scale projects Paul Schneider-Esleben was commissioned in 1950 by the industrialist Franz Haniel to construct a multi-storey car park on an empty piece of ground next to his factory in the east of the city. A commission that must be understood in context of its time. On the one hand the recovering economy of post-war West Germany, particularly notable in a city such as Düsseldorf which profited from its location on the Rhein and both the local heavy engineering and textile industries, brought with it increased private car ownership, and thus the need for new approaches to integrating cars into daily life. And for all integrating cars into daily urban life. 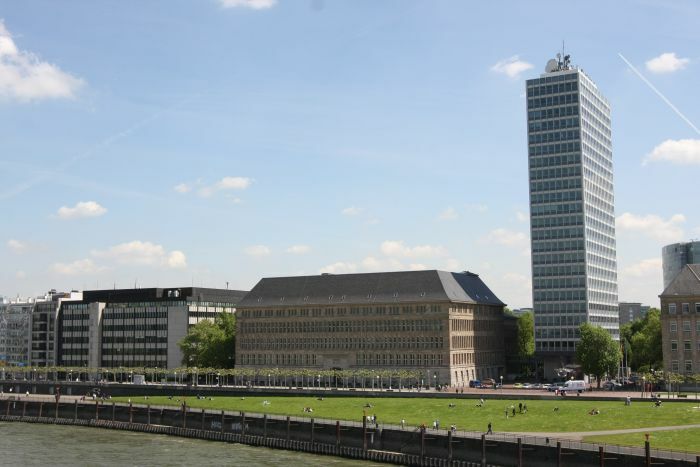 Franz Haniel’s intention, if you will his response to this challenge, was to offer visitors to Düsseldorf a location where they could park their cars before completing the journey into town via public transport; Lichtplatz being as it is just 3 kilometres from downtown Düsseldorf. And thus a proposition diametric to the “cars into the very heart of cities designed for cars” urban planning which subsequently achieved popularity. And whose curse still haunts and suffocates us. And arguably lies behind the fascination with autonomous cars. In addition, the Lichtplatz car park, popularly known as Hanielgarage, was developed against the background of the so-called Architektenstreit – Architect Dispute. In essence, for this isn’t the time nor place for an extended discussion of the topic, in 1949 Düsseldorfs Head of Building and Planning Friedrich Tamms published a plan for the post-war development of the city, a plan criticised by sections of the Düsseldorf architecture community for being based not only on traditional conservative principles, but also for being based on the urban planning principles of the Nazis. A situation not helped by the fact that Tamms and several of the leading architects and urban planers involved in the programme had been closely involved with helping Albert Speer develop his plans. Those, generally younger, architects, including Paul Schneider-Esleben, who opposed the plans formed the group the “Ring” which argued for a more progressive programme, one more in keeping with the principles of the inter-war international modernists, one which acknowledged Le Corbusier’s so-called Charta of Athens urban planning principles, and which for all, was a lot less Nazi. Among the, many, contentious points was the question of where to park all the aforementioned new private cars. Tamms favoured the extensive provision of parking spaces, while, as Regine Hess notes, “the members of the “Ring” also demanded the construction of multi-storey and underground car parks, rather than a sole focus on, as outdated criticised, parking spaces”3 The Hanielgarage can thus be considered as the progressive forces in Düsseldorf’s architectural and industrial communities publicly sticking a couple of fingers up to Tamms and his parking spaces. Lichtplatz Car Park (Hanielgarage), Düsseldorf by Paul Schneider-Esleben. The neighbouring Motel, with access to the exit ramp. 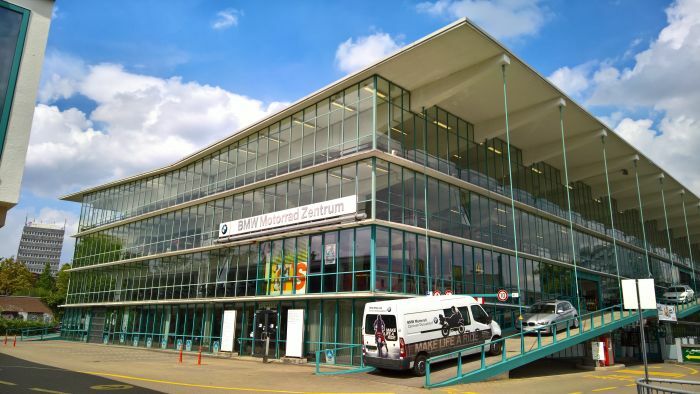 Although multi-storey car parks had existed before the war, the Hanielgarage was one of the very first post-war multi-storey car parks in Germany, with space for 500 cars arguably the largest of its day, and in its architecture without question the most remarkable, influential and important. Featuring a cantilevered concrete skeleton shrouded by a transparent glass curtain wall, the car park was a revolution for its age, not just in terms of material and construction but also in terms of its formal composition: its openness, visual lightness and unequivocal expression of its function taking the ideas started by the inter-war modernists into new realms. 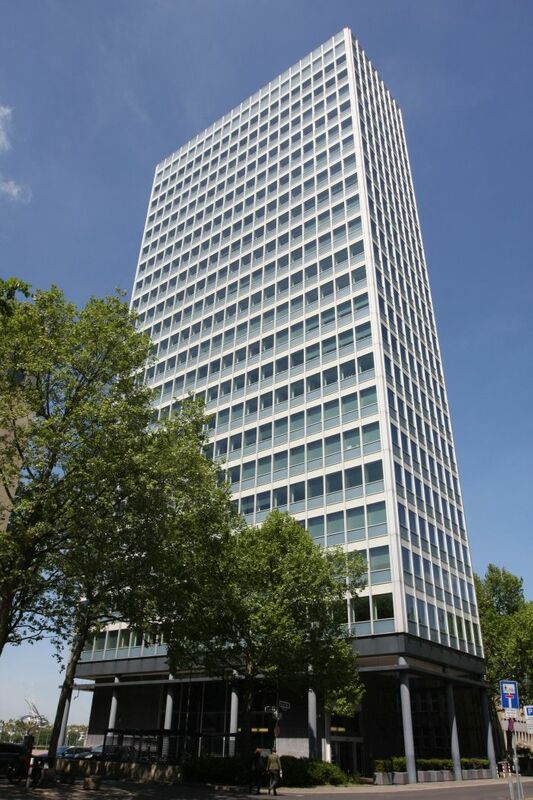 In our Tour d’ l’architecture Düsseldorf we highlighted the 1953 former US General Consulate by Skidmore, Owings & Merrill as an early introduction of post-war functionalist architecture to Germany. Paul Schneider-Esleben was finished first. The car park’s defining feature is without question its entry and exit ramps, hung as they are on steel wires on the outside of the building. On the one hand a bold, forthright, and unapologetically brutalist statement. And on the other a textbook example of how, for all their innovation and bravery, European post-war architects could, occasionally, look a little too long at the new impulses coming from America: because the ramps were exposed to the elements they feature radiant heaters5 to stop ice forming on them in winter. Or put another way, in southern California an ingenious piece of architecture, in Düsseldorf bordering on the decadent. More than just a multi-storey car park the ground floor featured a petrol station, car wash and repair workshop while the neighbouring two storey building housed a 19 bedroom hotel, a restaurant and three flats which served as staff accommodation. Modernised and repaired in 1993/94 the Lichtplatz car park is today a BMW dealership and a McDonalds, the former motel housing a Chinese restaurant. Rudolf Schawrz, who a decade earlier had introduced Schneider-Esleben to international modernism, called the Lichtplatz car park a “sacred cathedral-garage”6, and the importance of the project can be reflected in the widespread coverage it attracted in the contemporary domestic and international architectural publications including Bouw, The Architect, Architectural Forum and L’Architecture d’Aujourd’hui which commented that the car park was “one of the most characteristic achievements of present-day Germany” Even if they did also query why a country with such acute housing problems was building such a luxurious car park. Touché. Future decades saw Paul Schneider-Esleben expand on this reputation, developing numerous large scale, acclaimed, projects including, and amongst many others, the headquarters of the Stadtsparkasse Wuppertal, the Roland School Düsseldorf and Cologne-Bonn Airport, completed in 1970 and a project which brought a new, elegantly simplified, form language and for all logical passenger flow and process integration to airport design. And which much as the Lichtplatz car park had changed ideas about what a car park could or should be, advanced understandings of airport design. That save for projects such as Jesuit Monastery in Munich and the School for the Steel and Metalwork Industry in Hamburg, Paul Schneider-Esleben built relatively little outwith his native region of Nordrhein-Westfalen, can barely be seen as his fault: throughout his career he participated in numerous domestic and international completions, albeit without success. And one must also remember the idea of the internationally active architect is relatively new, and if one’s being honest, remains one reserved for a relatively small, select, group of architects. 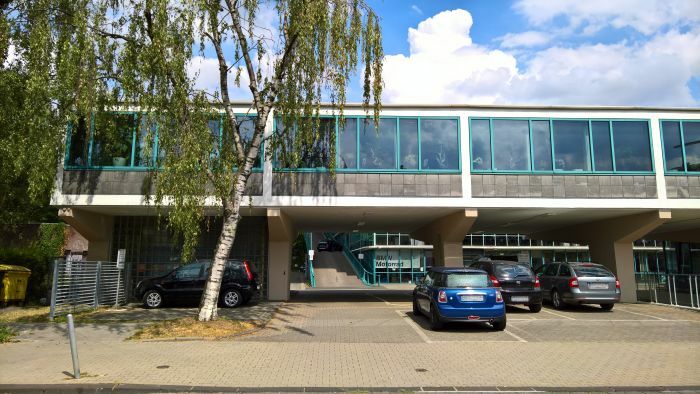 The rest of the world’s loss was however the people of Nordrhein-Westfalen’s gain and today the buildings of Paul Schneider-Esleben stand as testament to the elan of the post-war decades, the optimism arising from new technology and the faith placed in industrialisation. The world may not have developed as society had hoped, technology and industrialisation may not have been the celebrated panacea, but that can’t detract from the ways Paul Schneider-Esleben helped advance ideas about architecture, nor from the spirit of the age nor the lessons that we can learn from the way our forefathers approached their contemporary challenges. In addition to developing and realising his own projects, Paul Schneider-Esleben served from 1963 until 1972 as a Professor at the Hochschule für bildende Künste Hamburg. Active as an architect well into his 70s Paul Schneider-Esleben died in Fischbachau, Bavaria, on May 19th 2005, aged 89. In addition to buildings Paul Schneider-Esleben, and as with so many of his contemporaries, regularly designed the furniture and fixtures therein, a few of which were, when albeit only briefly, produced commercially, including the office furniture system from the Mannesmann-Hoschhuas which was produced by Flötotto, the assembly hall chairs from the Roland school which were produced by Thonet, the wash hand basins from the same project being briefly distributed by Keramag. 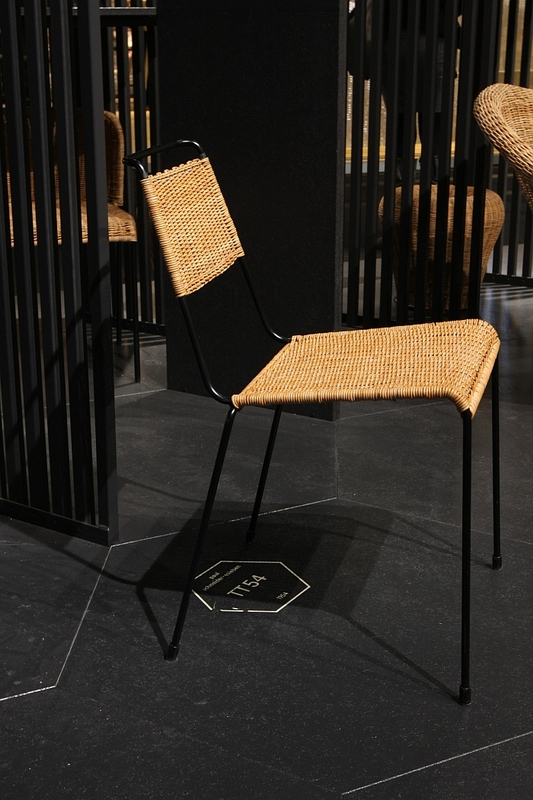 In addition a stackable chair crafted from round iron and wickerwork was briefly produced in the 1950s by Wilde+Spieth before being re-launched by Richard Lampert at IMM Cologne 2017. And an object which we really hope will soon be accompanied by the complimenting sofa. As a leading figure in the Düsseldorf architecture community Paul Schneider-Esleben naturally had contact with the students and staff at the city’s Kunstakademie, contact which saw the realisation of several joint projects, in particular Kunst am Bau projects for his buildings with the likes of the art collective ZERO, Josef Beuys or Norbert Kricke, while the majority of the photos of Schneider-Eslebens buildngs were taken by Düsseldorf photographers such as Inge Goertz-Bauer or Liselotte Strelow8 and thereby directly contributing to the development of Düsseldorf’s reputation as creative city. While less directly, Paul Schneider-Esleben’s eldest son is the flautist Florian Schneider, founding member and driving force behind the band Kraftwerk, and thus in his own way also the architect of a progressive, avant-garde Düsseldorf creative tradition. But how does one celebrate the birthday of such an architect? We’ll raise a glass to that!